Homeopathic remedy to address sneezing, itching, watery eyes, running nose associated with hay fever. How has Hayfever Fighter helped others? How do I use Hayfever Fighter? Seasonal allergies are allergies that result from seasonal pollens that occur at specific times of the year – most commonly during spring, summer and fall. While most of us may look forward to spring or fall, allergy sufferers dread the arrival of these seasons. This condition is caused by an overactive immune system that responds to the allergen – usually the pollens. Rare symptoms may also include: depression, loss of appetite and insomnia. Allergy sufferers may also commonly experience eczema and asthma as well as rashes when they have bouts of seasonal allergies. A lot can be done to support easy breathing and help the body combat common irritation. Avoiding the outdoors when pollen counts are high can help a great deal. Keeping doors and windows closed when it is windy is also a good idea (and limit fresh flowers indoors!). Regular cleaning of drapes, or other household items that are near windows can limit pollen particles in the home. Clothes that hang outside to dry may need to be brushed and shaken before being brought inside (or dry them indoors as an alternative). If you do venture out on a windy day, wear sunglasses to help protect your eyes from airborne particles. Natural remedies can also help to support the eyes, nose and throat and to keep membranes soothed – helping to support easy breathing with little discomfort. In fact, natural remedies have been used in traditional medicine for thousands of years to support the healthy functioning of respiratory system general. Hayfever Fighter a 100% natural homeopathic remedy formulated for the relief of hay fever symptoms, including sneezing and itching, watering eyes and noses. Hayfever Fighter has been used to safely maintain harmony, health and systemic balance in the respiratory system, without harmful side effects. This remedy contains a selection of homeopathic remedies known for their ability to address common discomfort associated with hay fever. Due to the concentrated tincture formula, Hayfever Fighter Drops are absorbed into the system with ease – to get to work immediately! Arsen iod (6C) - is a good choice to address those who become very hot and flustered or bothered. Any nasal discharges also tend to benefit from this remedy. Euphrasia (6C) – this remedy has been used since the Middle Ages to keep eyes healthy and bright. It is very beneficial when taken internally. Other benefits include the supportive capacity of good vision and eye health. Allium cepa (6C) - is a remedy well known for its supportive effect on the respiratory tract and which has a long history of use in maintaining clear eyes and noses. Wyethia (6C) – this homeopathic ingredient has been used for many years to help soothe irritable throats of singers and public speakers, making it useful too in addressing common hay fever symptoms. Kali bich (6C) – useful in soothing the mucous membranes of air passages or when a running nose is present. Sambucus (6C) - is a well-known homeopathic remedy for the throat and respiratory tract. It is also a valuable aid to keep the respiratory tract clear of congestion. Hayfever Fighter contains no gluten, artificial flavours, colours or preservatives. It is suitable for vegetarians and safe for all ages. 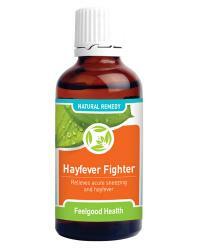 Hayfever Fighter is presented in a concentrated 50ml tincture formula, making it easy to take. Hold bottle upside down and administer 10 drops directly into the mouth. Alternatively dilute 10 drops in quarter cup water and sip slowly. Children under 12 years use 5 drops. Dosage may be repeated every 20 - 30 minutes if needed until symptoms subside. May be used with AllergiClear for ongoing respiratory support. Hayfever Fighter supports the body on a cellular level – helping to support clear eyes and noses, and open airways - from the first dose. Hayfever Fighter contains homeopathic ingredients in a tincture formula that facilitates rapid absorption into the system. One bottle of Hayfever Fighter will last approximately 30 days (depending on frequency of use). Allergy Power Pack: Fight all symptoms of hay fever and allergies plus long term support! Soothe itchy eyes, fight hay fever and allergy symptoms plus long term allergy support! No More Sneezes: soothe itchy eyes, hay fever symptoms and sneezing fits! Fight hay fever symptoms plus open sinus passages! Soothe sticky, itchy eyes while fighting off hay fever symptoms! Fight hay fever symptoms, itchy eyes plus soothing eye wash!